The Arizona Court of Appeals ruled today that a 2010 law adding two at-large seats to the Maricopa County Community College District governing board is unconstitutional, meaning the candidates for those seats will not be on the 2014 general election ballot. Former Maricopa County Supervisor Mary Rose Wilcox has won an appeal over a $975,000 settlement in her lawsuit against the county for a failed criminal case made against her in late 2009. Sen. Steve Gallardo has dropped out of the race to represent Arizona’s 7th Congressional District in favor of a run for the Maricopa County Board of Supervisors. Sen. Anna Tovar announced Thursday she won’t run for public office in the 2014 campaign cycle, relinquishing a possible bid for a seat on the Maricopa County Board of Supervisors. A judge ruled that a law creating two new at-large seats on the Maricopa County Community College District governing board is constitutional and will allow elections for those seats to move forward. 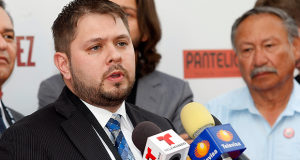 The Maricopa County Board of Supervisors is creating a three-member panel to decide who will replace outgoing state Rep. Ruben Gallego of Phoenix as he attempts to win a U.S. congressional seat now held by U.S. Rep. Ed Pastor. Gov. Jan Brewer returned to the place where the first seeds of her political career were planted to announce her retirement after more than 30 years in public office. The Maricopa County Board of Supervisors today appointed former lawmaker David Farnsworth as the next state senator in Legislative District 16. Legislative District 16 precinct committeemen from Maricopa County GOP are scheduled to meet Saturday evening to nominate three candidates to serve as the district's next Arizona state senator.